Ready for a kitchen renovation? Anxious for a bathroom remodel? The easy part is knowing your goal for home remodeling — whether you’re trying to keep up with your growing family, add office space, or increase your home’s value. But figuring out how to plan a home renovation that doesn’t break the bank can be tricky. Here are five key steps in planning your home remodeling project. As a general rule of thumb, you should spend no more on each room than the value of that room as a percentage of your overall house value. For example, a kitchen generally accounts for 10 to 15 percent of the property value, so spend no more than this on kitchen renovation costs. If your home is worth $200,000, for example, you’ll want to spend $30,000 or less. Something else to keep in mind: Contrary to popular belief, kitchen renovations offer among the lowest return on investment, according to analysis from Zillow Talk: The New Rules of Real Estate. Every dollar you spend on a kitchen remodel increases the value of your home by 50 cents. The highest return on investment? A mid-range bathroom remodel. 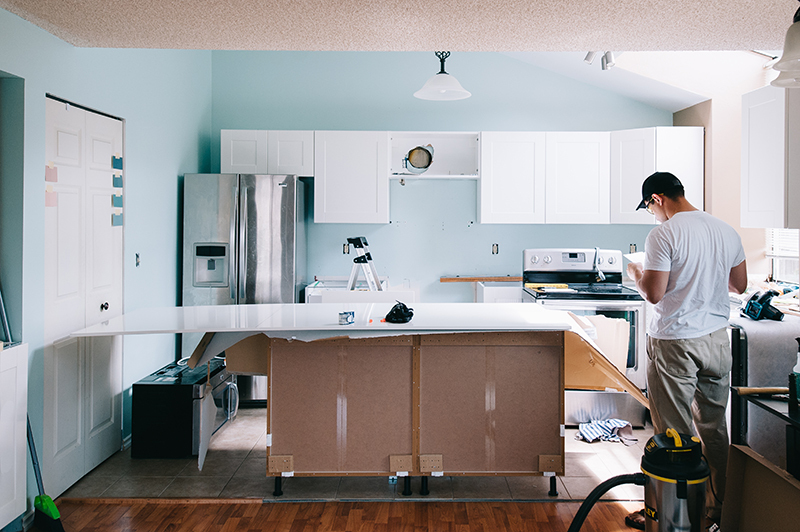 If you plan on borrowing money to fund your home renovations, there are a number of loans out there to help with just that. Refinancing. Depending on your current interest rate, you might be able to refinance your mortgage at a lower rate and/or for a longer loan term, which could lower your monthly payments and help you save up for your renovations. Cash-out refinance. If you have enough equity, you could also consider a cash-out refinance, which means refinancing your existing loan for an amount that’s higher than what you owe. Going this route, you pay off your original mortgage and have cash left over. HELOC. If refinancing sounds like too big of a leap, a home equity line of credit (HELOC) might work better. A HELOC works a lot like a credit card in the sense that it has a set limit that you can borrow against. Home equity loan. Although it sounds similar to a HELOC, a home equity loan is a bit different. This loan requires you to take out all the cash at one time. They’re often referred to as “second mortgages” because homeowners get them in addition to their first mortgage. Refinancing, getting a HELOC or taking out a home equity loan are all big decisions, and it can be tough to know which one makes the most sense for you. As with any new loan, consult with a lender to see which option is best for your situation. Some contractors will give you an estimate based on what they think you want done, and work completed under these circumstances is almost guaranteed to cost more. You have to be very specific about what you want done, and spell it out in the contract — right down to the materials you’d like used. Get quotes from several contractors, tossing out the bid from the one who gives you the lowest estimate. Going with this choice could be asking for problems, as low-priced contractors are known to cut corners — at your expense. As the renovation moves along, you might be tempted to add on another “small” project or incorporate the newest design trend at the last minute. But know that every time you change your mind, there’s a change order, and even minor changes can be costly. Strive to stick to the original agreement, if possible. Your home may look perfect on the outside, but there could be issues lurking beneath the surface. In fact, hidden imperfections are one of the reasons renovation projects end up costing more than you anticipated. Rather than scramble to come up with extra money after the fact, give yourself a cushion upfront. Factor in 10 to 20 percent (or more) of your contracted budget for unforeseen expenses, as they can — and do — occur. In fact, it’s rare that any project goes completely smoothly.